Democrat Barack Obama came into the heart of conservative Virginia Monday with a populist, anti-war appeal and won howling ovations from a crowd shivering in the autumn chill. Obama, the second Democrat in as many months to campaign in this university town, took on both President Bush and his chief Democratic rival, Hillary Clinton, as more than 4,000 supporters who had stood in line for hours cheered. "You have to admit it. You are tired of an administration that treats our constitution as a nuisance," Obama said. "You're tired of an administration that tries to widen the gulf between rich and poor," he said. "But most of all, you are tired of a war that should never have been authorized." Trailing Clinton in polls two months before the first nomination contests, he assailed both Bush for sending troops to Iraq and Clinton for voting in 2002 for the deployment. "I spoke out against that war and that is the kind of experience I bring to bear in this campaign," Obama said. "I may not have the kind of experience that Washington likes, but I have the experience we need right here, right now," he said. That was just fine with Gregory Olsen of Salt Lake City, a third-year University of Virginia law school student. He said he's looking for a candidate not beholden to the status quo in Washington next year. "People say he has no experience, but I see that as an asset, not a liability," said Olsen, who bought tickets for himself and his wife, Michelle, the day they went on sale about three weeks ago. Obama also attracted plenty who have not decided yet how they will vote. Retirees Emil and Nancy Kritzer drove from Nelson County to Charlottesville to see if Obama is what they're looking for. "We want to see someone with enough leadership skills to tell this country what it has to do, even if they don't want to hear it," Kritzer said. Obama campaigned about three blocks from the site of a Clinton fundraiser a month ago. Both of them sense a possible Democratic triumph next year in a state that has backed Republicans in every presidential election since 1964. Democrats rarely bothered bringing presidential campaigns to Virginia since the 1980s. This year, Clinton, Obama and former North Carolina Sen. John Edwards have several visits to downstate Virginia to their credit. Republicans say Democrats are celebrating too soon. "The more time the Democrat presidential candidates spend in Virginia touting their liberal proposals to raise taxes for hardworking families, increase the size of government, and cut funding for America's troops, the more likely voters in this state will once again elect another Republican president in 2008," said Amber Wilkerson, a Republican National Committee spokeswoman. Gov. 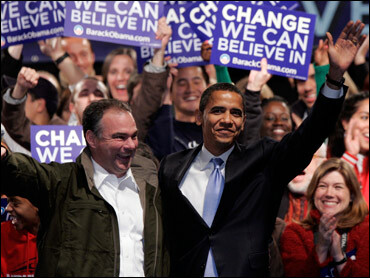 Timothy M. Kaine, one of the first governors to endorse Obama, introduced him Monday and pledged to travel to Iowa to help Obama campaign.